Prepare Your Assault on Castle Mitternacht! Three new adventures are coming to Card Hunter! On Halloween, the blight began to issue forth from Castle Mitternacht. Now it threatens to consume all of Cardhuntria! The Baron of Shieldhaven entreats you to take action. Travel to the distant reaches of the land, protect the townsfolk, and stop Countess Jovana! Three new high-level adventures are coming soon. Beginning with “The Spreading Blight,” a free adventure for all players, you’ll embark on a perilous journey through the lands of the late Lord Makhail. Over the course of your adventures, you’ll encounter dastardly new foes and overcome treacherous obstacles… and, of course, find priceless loot! The new adventures are level 21, and will show up on your campaign map automatically once you’ve beaten any one of these other high-level modules: The Metallic Monstrosity, The Troll Tyrant, or Return to the Caverns of Chaos. Note that these are serious challenges: you’ll need every hit point and power token you can get, especially if you’re planning on completing all the quests for these adventures! In conjunction with the release of this content, we will also be putting all our foil figures on 50% off sale. Deck out your inquisitors for the low price of 80 pizza each! Finally, we are refreshing our starter party shop with the addition of the all-new Inquisition pack! Play as three inquisitors with a variety of silver attacks, bringing werewolves and vampires to their knees! 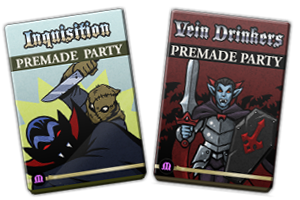 We’ve also redesigned our Veindrinkers pack to include many Castle Mitternacht items. This unholy trio has never been so deadly! Each party includes 3 powerful epic items. All this great stuff will be available after our new build is released. The deployment is scheduled for Wednesday the 21st of June at 1am GMT (click here for some local times). Things will be back up and running an hour or two after that. Thank you so much for all the hard work. I apologize for my faithless impatience. I’m so glad to see you guys continuing to invest your hearts into this game. It is a blessing to my family and a classic that I hope will be around for years to come. Three things I would like to request! Rumor class expansions become real. From what they’ve stated in the game! Two more level expansions that don’t require treasure hunting. Maybe a season 2 for the storyline. A third printable version of the actual playing field maps. I like Card Hunter very much and recommend it to everybody. Good work and good game!